Isle of Dogs might just be Wes Anderson’s most accomplished film yet as a filmmaker. Coming off his most successful film with 2014’s The Grand Budapest Hotel, Anderson returns to the world of stop motion animation that he previously visited having directed 2009’s Fantastic Mr. Fox, which I very much enjoyed when I saw it. 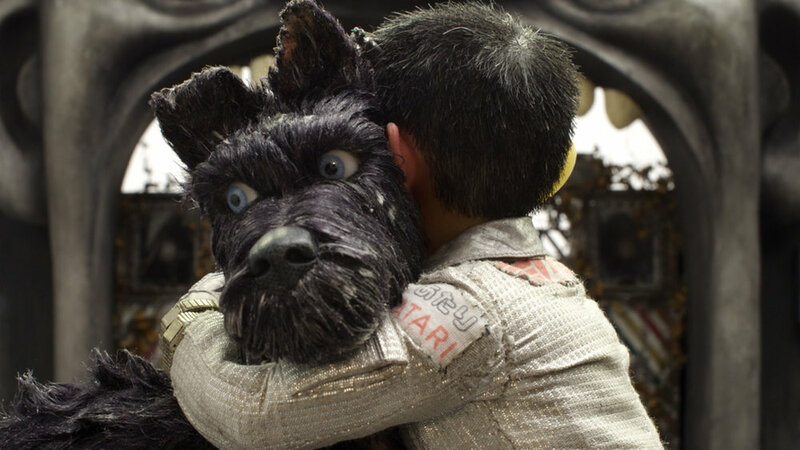 Isle of Dogs is a charming film from start to finish with some huge laughs along the way and a big heart. Even though this is in the same wheelhouse as previous Anderson’s films, this is oddly enough his most accessible film to date. In the not too distant future in Megasaki City, a fictional Japanese city, there has been an outbreak of dog-flu and snout fever. To quarantine this epidemic, Mayor Kobayashi (story co-writer Kunichi Nomura) declares an order to place all dogs on nearby Trash Island. It’s also revealed that throughout the ages, his family lineage prefer cats to dogs. After several months, a young boy named Atari (newcomer Koya Rankin) crash lands onto Trash Island to find his beloved dog Spots (Liev Schreiber). Assisting Atari on his journey to find Spots are fellow dogs Chief (Bryan Cranston), Rex (Edward Norton), Boss (Bill Murray), Duke (Jeff Goldblum), and King (Bob Balaban). Since Japanese cinema heavily influenced this film, we can tell that Anderson wears those influences heavily on his sleeves. For example, the mechanized dogs look similar in design to Mecha-Godzilla from the Toho’s Godzilla series and the laboratories look like something you would see from a science fiction film. The storyline (written by Anderson from a story from him, Nomura, Roman Coppola, and Jason Schwartzman) is simplistic enough that throughout the 101-minute runtime, you never get confused about what’s transpiring on-screen. The pacing is good for its runtime as well. With the way that Anderson presents the story to the audience, at times, it feels like a story coming to life, which is given since the film is split into five chapters like a book, and most of the characters speak directly to the camera, as if they’re talking to us. Even though it’s a stop motion film, I bought into the story that the film was trying to tell. Like with his previous films, you get the humor that Anderson typically exhibits, whether it’s a deadpan delivery or a visual gag. Truth be told, some of the visual gags were the funniest parts of the film. On top of that, all the actors that Anderson assembled for the film (most of them are from his previous films) were enjoyable in the roles they were selected, with the MVP in my opinion being Cranston as Chief, a stray dog in the pack that helps Atari. Like with his other films, Anderson plays with symmetry in the look of the film, and the visual design that was employed was splendid. Case in point, whenever the dogs fight, it becomes a ball of smoke like we’ve seen in previous animated films or shows. The film gets political here and there. Even though it’s a stop-motion film about dogs, Anderson uses it as a springboard to discuss larger topics at hand, like the use of fear mongering, corruption in politics, and uses the plight of the dogs as metaphors. The music choices were spot on, including tracks from Akira Kurosawa’s Seven Samurai and Drunken Angel, since Anderson started that his films were a big influence, and once again, Alexandre Desplat composes another great score for Anderson (he previously won an Oscar for The Grand Budapest Hotel). If there are any criticisms that I had with this film, it’s that sometimes Anderson throws too much info at the audience. Since we have an overload of information, it feels like as the film gets toward the end it runs out of steam just a tad. Some of the subplots don’t bring anything to the film and if Anderson trimmed some of them out, the film would have played just as well. As usual, if you don’t like the humor his films tend to employ, you might not view this as funny. Overall, even though we’re in the month of March, it’s safe to say that Isle of Dogs is easily one of the best films of the year so far. At the heart of the film, it’s a story about a boy’s love of his dog, and how dogs are truly man’s best friends. This film shows growth for Anderson as a filmmaker, and is clearly one of his best films to date. I enjoyed this more than what I was anticipating going into it. I urge you to seek this film out as soon as you can, and I would most definitely recommend checking this out in a theater! Richie Wenzler is currently finishing up getting his M.F.A. in Film and Electronic Media at American University. He's currently working on his thesis film. Previous to that, he received a BA in Communications & Culture and Telecommunications at Indiana University. He's a perpetual film student and is chasing his lifelong dream of working in the film industry. Feb 23 "Annihilation" Review: Subverting The Norm For The Win!